Brendan Rodgers has lost faith in Simon Mignolet, and will look to bring Fiorentina goalkeeper Neto to Anfield in January, according to Italian publication Tutto Mercato. Arsenal WengerIn: Why Arsenal must stand by Arsene Wenger despite growing calls for the Frenchman to be sacked. Mignolet has been extremely poor this season, and with Brad Jones the only backup option available, the Liverpool boss has begun to look for a replacement. 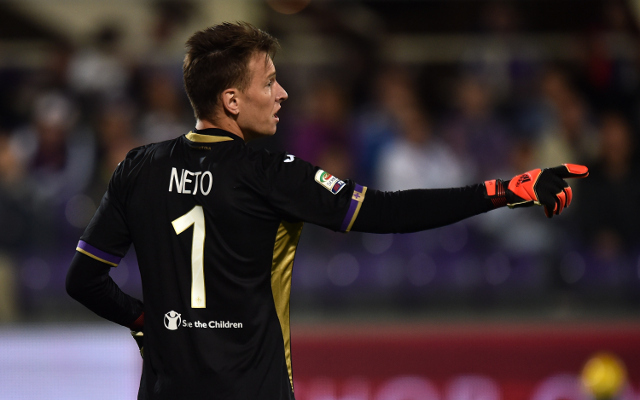 Reports in Italy suggest that Neto is a top target for the Merseyside manager, despite the fact that he looks close to extending his current deal with Fiorentina. If he declines a new contract then he will be a free agent at the end of the season, and if the Serie A side want to avoid losing him for nothing then they will have to sell him cheaply in January. Liverpool’s Belgian shot-stopper may even benefit from the competition, and the introduction of Neto may even see him raise his game at Anfield. With Brad Jones as the No.2 however, Mignolet is all but guaranteed to start between the sticks week in and week out.